You can make one big batch and keep them in your fridge for a week or freezer for up to 3 months. They’re pre-portioned so there’s built-in portion control. They’re super easy to reheat in the oven, toaster oven or microwave. They’re super portable so you can take then on-the-go. The flavor combinations are endless aka you can switch things up week to week so you don’t get bored. How do you make oatmeal cups? 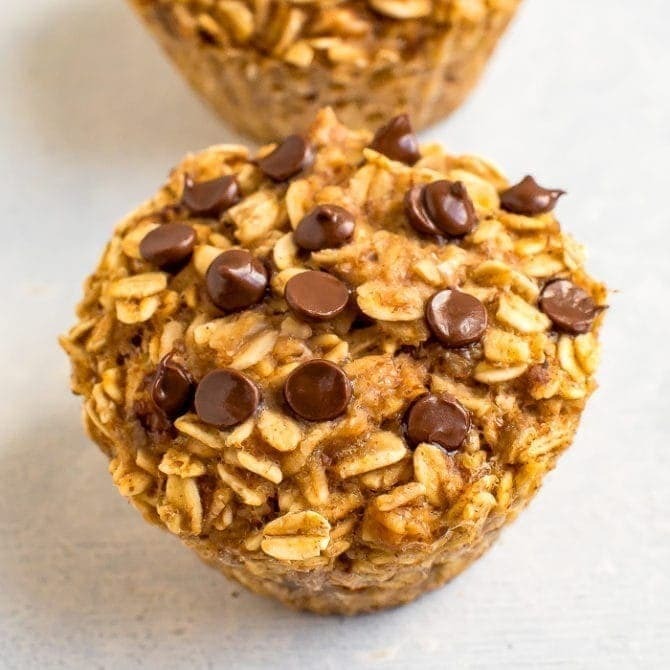 Oatmeal cups are very similar to muffins. 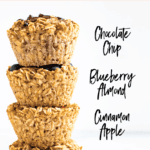 The main difference is that oatmeal cups are flourless because you’re just using oats and they have more liquid added to the batter. 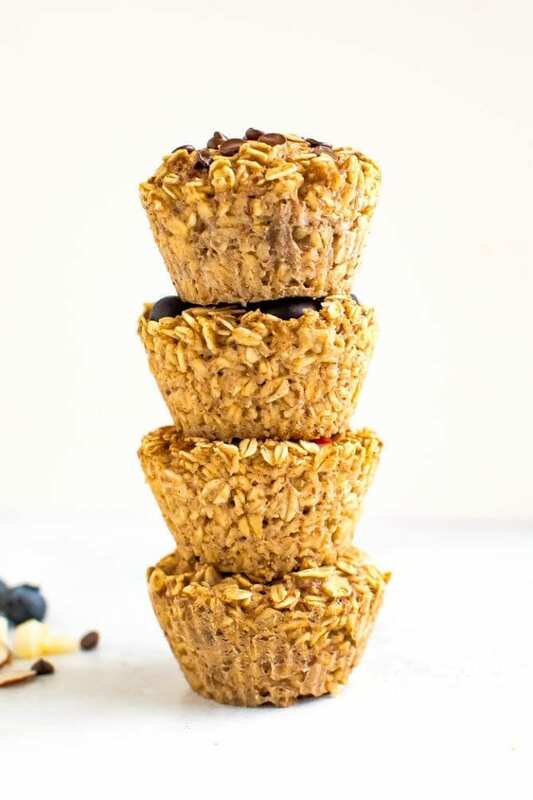 In addition, muffins (especially bakery-style muffins) often have a lot of processed flour and sugar, but oatmeal cups are made with the same healthy ingredients you’d would put into a bowl of oatmeal! Huge win! 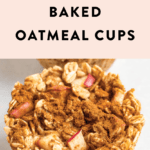 To make these oatmeal cups, you simply mix your dry ingredients in one bowl and your wet ingredients in another. Combine the two gradually and then put the batter into muffin cups. 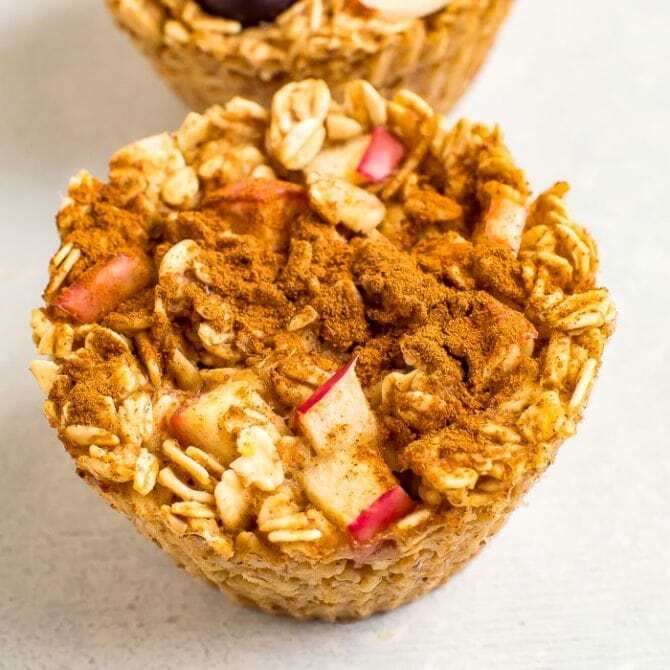 Bake 30-35 minutes at 350°F and voila… you’ve got baked oatmeal cups for the week. 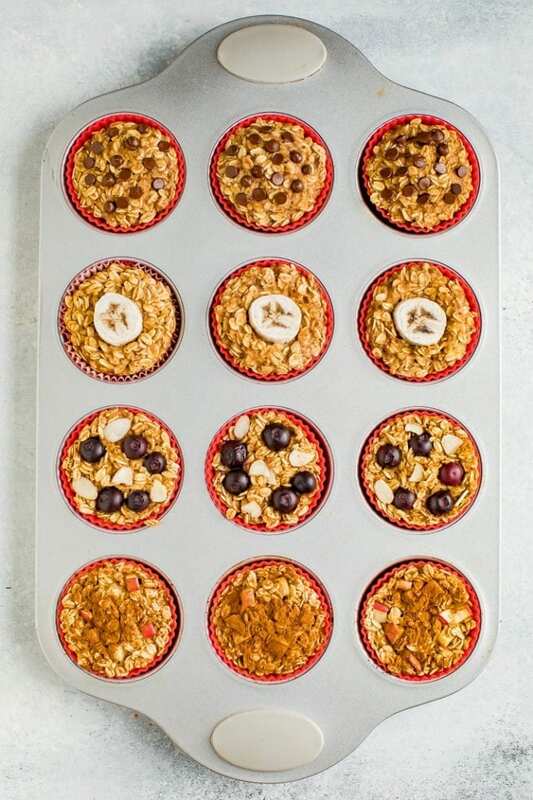 You can totally just use a greased muffin tin, but highly recommend investing in silicone liners because the oatmeal cups will pop right out (no wasted oatmeal) and they are super easy to clean! 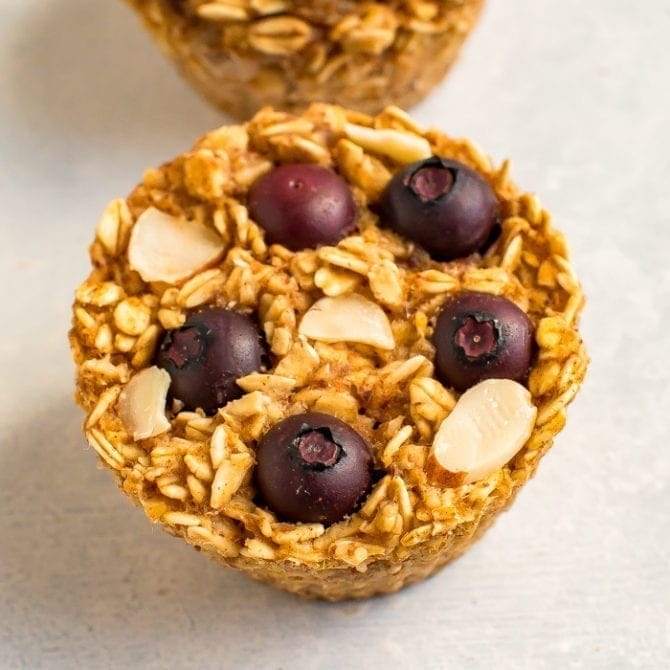 How long do baked oatmeal cups last in the fridge? 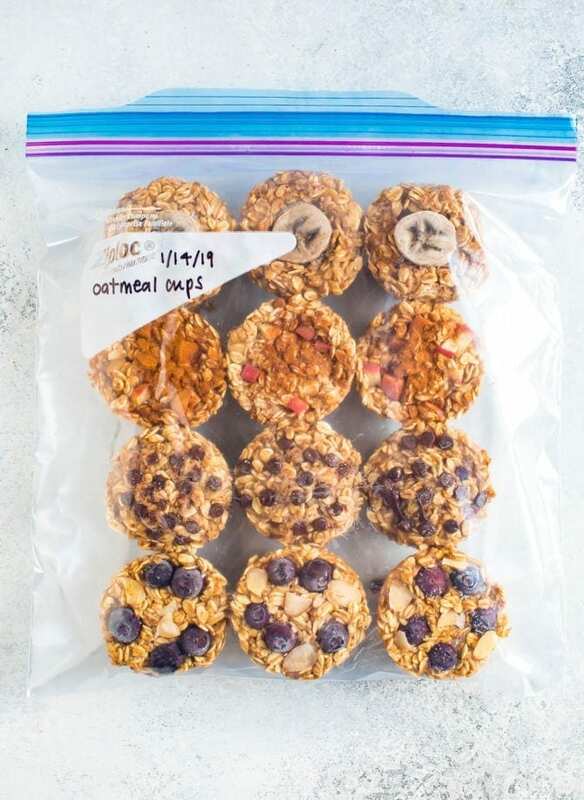 Can you freeze baked oatmeal cups? You sure can! Like I said, I love to make a bunch of oatmeal cups and then freeze any I don’t plan on eating that week. I usually put them in a ziplock bag made specifically for the freezer. When you’re ready to eat them, I recommend taking them out the night before and putting them in the fridge to thaw. In the morning (or whenever you’re ready to eat, pop them in the microwave or toaster oven if you prefer to eat them warm! If you forget to thaw the oatmeal cups, you can reheat it from frozen, it will just take a little longer. 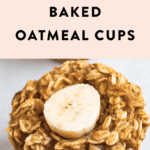 How do you reheat oatmeal cups in the oven? 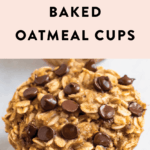 You can definitely reheat your oatmeal cups in the oven, but if I’m being honest I usually just pop them into the microwave or toaster oven to reheat them! 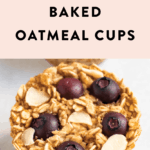 Oven or toaster oven: remove from liner and cut the oatmeal cup in half and heating on low (250-300°F) for 5-6 minutes or until the cup is warm throughout. 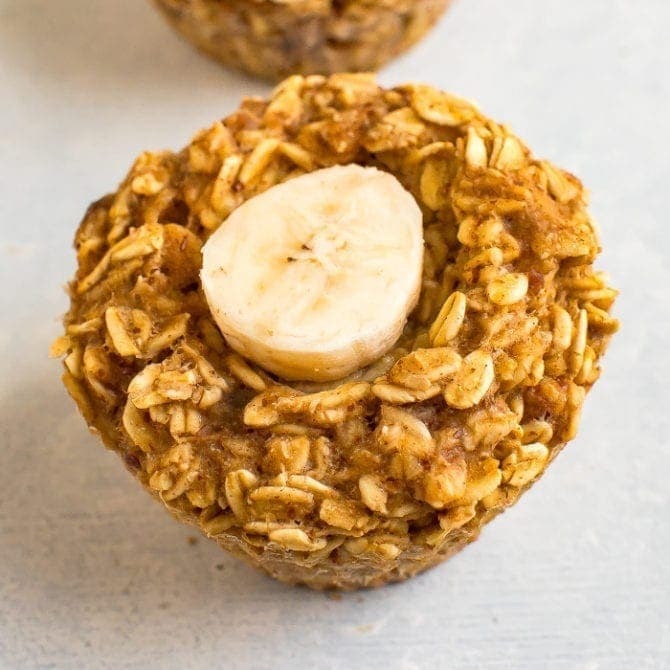 Microwave: remove oatmeal cup from liner and wrap in a paper towel, microwave until warm throughout, about 30-60 seconds. You can thaw the frozen cups by transferring them from the freezer to the fridge the night before or cook the oat cups directly from frozen. Just wrap the frozen cup in a paper towel and heat in 30 seconds increments until warm throughout. It should only take 1-2 minutes. 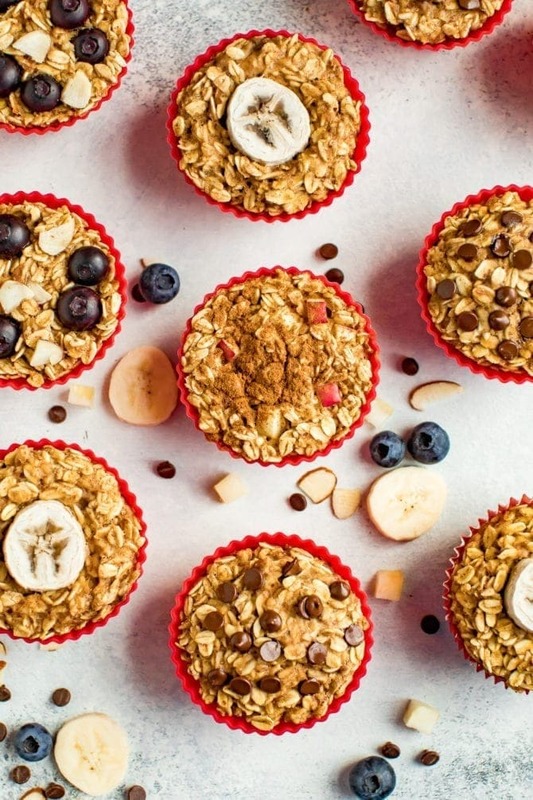 Now, onto the recipe for these baked oatmeal cups! As you might notice, each of the four flavors have a base recipe and then I add in specific ingredients to customize them. 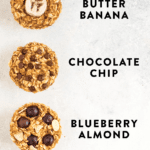 These are my top four go-to flavors and they’re all delicious — you can’t go wrong! 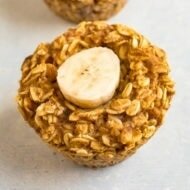 Want even more baked oatmeal cup ideas? 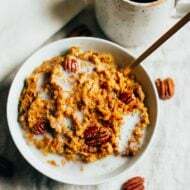 When you say “rolled oats” are they the old fashioned oats or the instant oats? Thank you!! Looking forward to making these! Good question, Cindy. I mean old fashioned oats, not the instant oats! Can you add egg whites to the mixture before you bake them to bump up the protein? like these a lot,The convenience of keeping them in the freezer for a good snack is a plus too. My favorite is probably the peanut butter one! 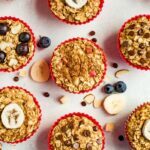 can you add protein powder to these? if so what would your recommended amount be? I think there’s an ingredient missing from the Peanut Butter Banana list; all it says is peanut butter and optional banana slices. How much banana goes in mashed? Good catch! It should say 2 mashed bananas for the Peanut Butter Banana. Just added that ingredient. I want to make all of them at the same time, so a little of each. How do i change recipe to make a little of each? I figure the oatmeal base is for one of the flavors at a time? Or are we suppose to split up base 4 ways? I know you said you can make a combo of them but it doesn’t say how to split up the ingredients or what the ingredients is for the combo? Does that make sense? I wasn’t sure about that. Hi Danielle! My recommendation would be to split the base 4 ways. You can make all the flavors using banana or applesauce in the base recipe OR make your base without the banana and applesauce, split it in half into two bowls and then add the apple sauce and banana to each, just remember to use 1/2 what the recipe calls for so 1 banana would go in the batch for the PB Banana and the chocolate chip and 1/4 cup applesauce would go in the batch for the apple cinnamon and blueberry. I hope this makes sense. Can I use quick-cooking oats for this recipe? Instead of almond butter or peanut butter or anything nut related (allergy) what should one use? Sunbutter (made with sunflower seeds) or tahini are probably your best bet! Hi, I was wondering, can I use chia seeds insted ground flaxseed. Thank you! I’m quite anxious to make them! Thank you for healthy recipes!! It’s frustrating to join or subscribe, & then get a bunch of recipes that are loaded with unhealthy stuff—chemicals, preservatives, sugar, artificial sweeteners, added salt, refined flours,… stuff like Lipton’s Onion Soup Mix, bottled BBQ sauce, Mayo (light or otherwise), white bread, hamburger buns, white rice, boxed cake mix, flavored/sugared yogurt…etc etc etc. So, I thank you for clean eating recipes!! 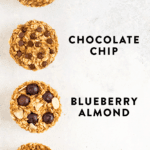 Do you think cacao nibs can be substituted for the vegan chocolate chips in your oatmeal cups recipe?? Bless you! !